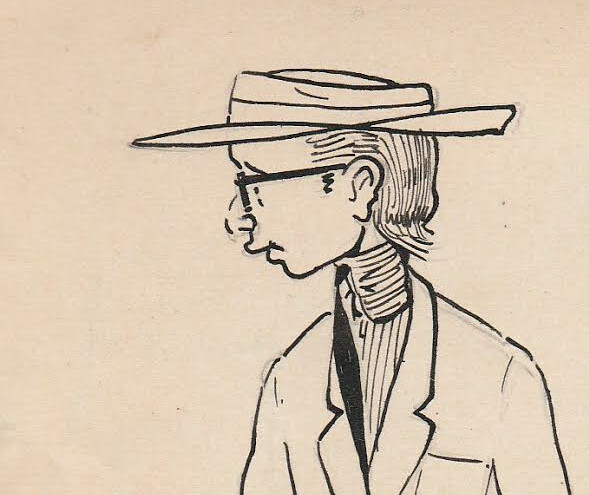 Famous Flemish comic collector Yves Kerremans contacted us a few weeks ago with a drawing by Bob De Moor he had found back in the daily Het Nieuws van den Dag of 2 November 1960. It depicts Sinterklaas on a roof full of antenna. Since it’s December 6th tomorrow, the day of Sinterklaas we thought it to be the perfect gift to all of our lovely young readers :). For those unknown with the phenomenon of Sinterklaas. He is a mythical figure with legendary, historical and folkloric origins based on Saint Nicholas. Other names for the figure include De Sint (“The Saint”), De Goede Sint (“The Good Saint”), De Goedheiligman (“The Good Holy Man”) in Dutch; Sintekloi in West-Flemish; Saint-Nicolas in French; Sinteklaas in Frisian; and Kleeschen and Zinniklos in Luxembourgish. Sinterklaas is celebrated annually with the giving of gifts on 5 December, the night before Saint Nicholas Day in the Northern Netherlands and on the morning of 6 December, Saint Nicholas Day itself, in the (Roman Catholic) southern provinces, Belgium, Luxembourg and Northern France (French Flanders, Lorraine and Artois). He is also well known in territories of the former Dutch Empire, including Aruba, Bonaire, Curaçao, and Suriname. What many don’t know is that he is the primary source of the popular Coca Cola Christmas icon of Santa Claus. But in Belgium we celebrate the original one and so did Bob De Moor in 1960! 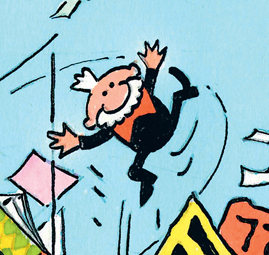 The drawing, signed as Bob De Moor, was made for the ‘Help Sinterklaas’ action run by De Standaard Soc. for the charity “Werken voor het Sinterklaasfeest der behoeftige kinderen” which would for years help children in need, focusing a lot on helping out disabled children from 1967 onwards. Many comic artists would contribute in the years to follow including Marc Sleen, Willy Vandersteen, Paul Geerts, Karel Biddeloo and so on. 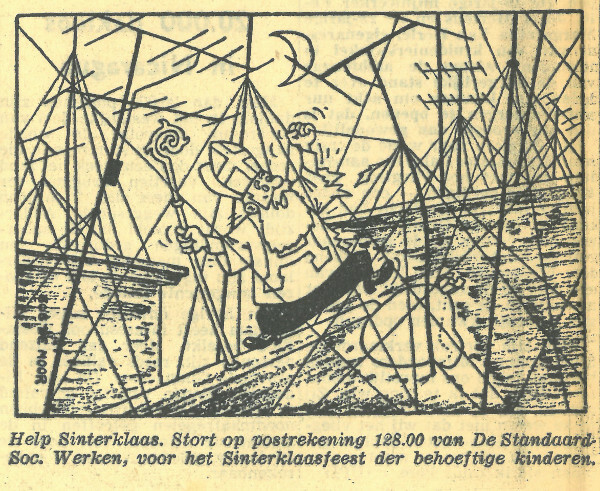 In this particular drawing you see Sinterklaas struggling to go over the roofs due to the many TV antennas blocking his way. To understand the joke, you need to know that TV had only been introduced in Flanders in the year 1957. By 1960 it had become very popular not in the least thanks to the Worldexpo of 1958 when special antenna’s had been installed across Belgium to improve the broadcast signal. As a result hundred thousands of roofs suddenly had all kind of ugly TV antenna’s placed on it. 1960 was also the year that the BRT (Belgische Radio en Televisie) was born (formerly known as NIR). It’s not De Moor’s most elaborated drawing, but it does have his typical humour. And it won’t take you much effort to imagine Once Zigomar in the role of Sinterklaas. In short, a small drawing, but with quite a lot of history around it. Thanks a lot to Yves Kerremans for this very rare gem! 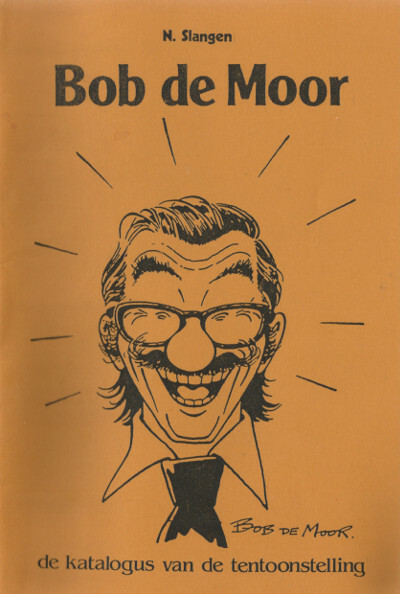 In 1982, more precisely from October 8 until November 15, the comic shop Stripgalerij Wonderland (located at the Paardsdemerstraat 19 in Hasselt (Flanders)) had an exposition on Bob De Moor. The expo opened the same day as the comic shop opened its door as it happens. The expo on Bob De Moor was followed by one on the work of the recently deceased Marc Sleen. To our surprise, one of the people behind that exposition turned out to be Noël Slangen (52), best known to the Belgian readers as one of the most (and probably the most) important communication advisors Belgium has ever known. A few years ago he sold his communications companies, and he waved the whole communications sector goodbye. He is now CEO of the internet company Musebooks.world. Musebooks.world is a rather interesting project as the company has developed a new way of reading digital art books. Check out the website to see what it is all about. 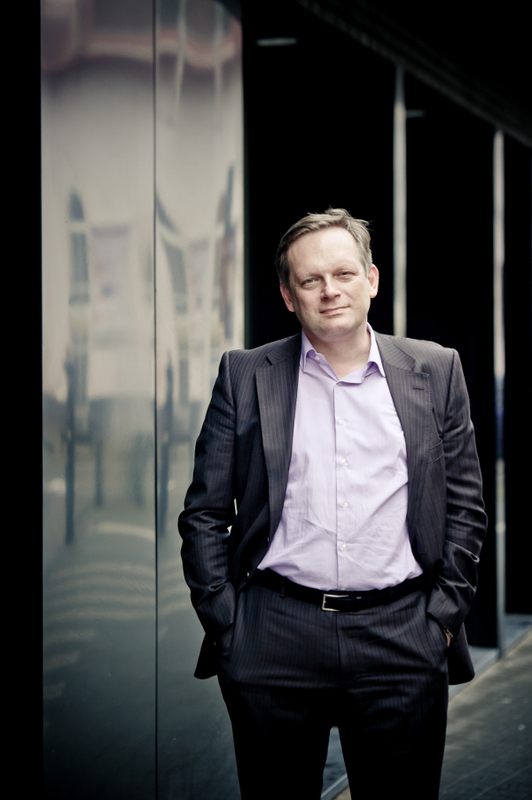 Next to that he is a columnist for the economics daily De Tijd plus senior advisor for UCARE Change where he coaches executives and entrepreneurs. But back to that exposition that took place some 34 years ago. 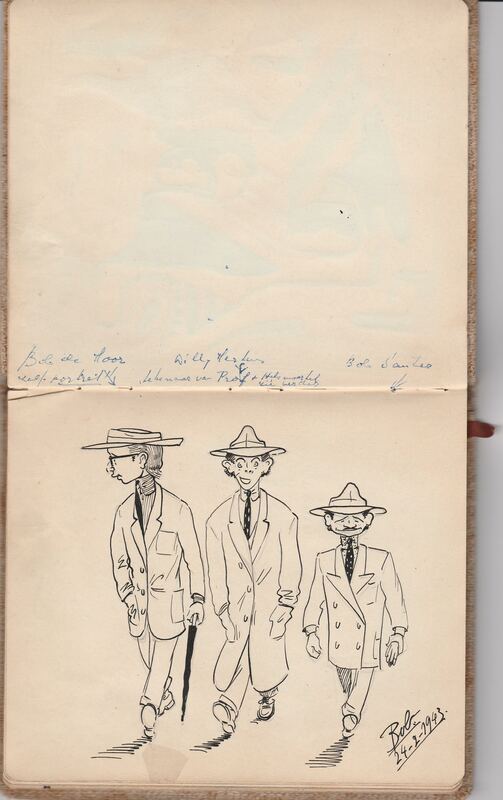 For that occasion the young Noël Slangen had prepared a catalogue including a short bio of Bob De Moor plus scans of drawings (see the front cover on the left). Here’s what Slangen remembers from that period. BDM: How did you roll into that Bob De Moor exhibition project? You were quite young no? NS: I was 15 or 16 (editor’s note: he was 18) and was totally into comics. When I didn’t have to be at school I worked in a comic shop with the name Wonderland. But apart from that, I was really fascinated by comics and that has never changed. It was an idea of Luk Poelmans, the owner of the shop, to have a Bob De Moor exhibition. But I already was a fan of him because of the reprints that were being made of his work for the real comic lovers. Small editions in black-and-white, but it served his work well because it honoured the beautiful inking and line of Bob de Moor. BDM: How would you define your affinity with his work? 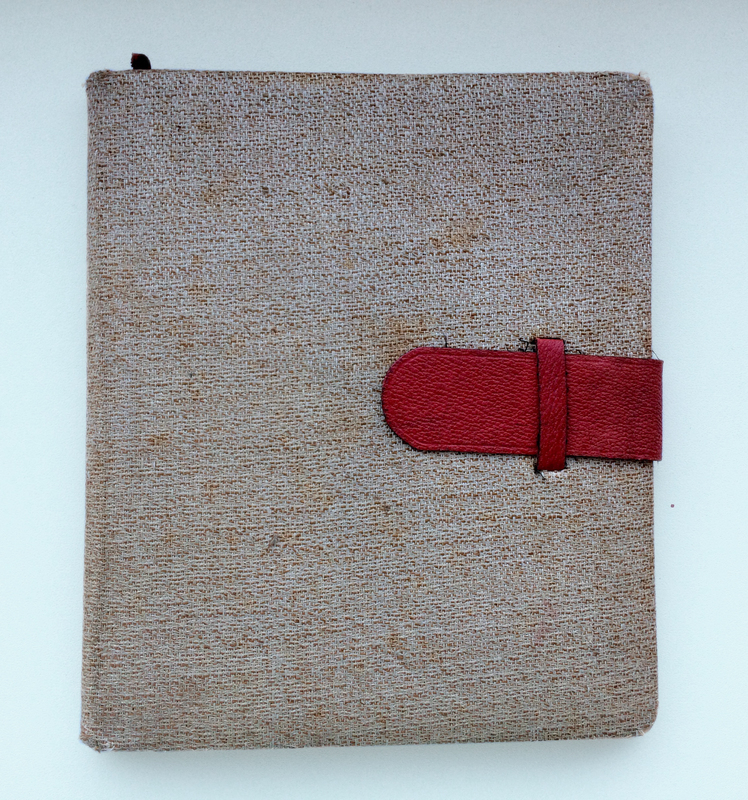 The booklet you published for the occasion was quite extensive considering it was pre-internet. NS: I had everything of Bob that a sixteen-year-old could buy for a reasonable amount of money. But I knew a lot of collectors thanks to my work in the shop. And they provided me with some really extraordinary work. Even an original plate of an adventure that Bob de Moor started but never finished. I have put it in the catalogue and Bob was astonished to see it. BDM: You have met Bob De Moor various times, how could you describe the man? NS: He was impressive and modest at the same time. His professionalism was well known, but he was such an amiable guy. You just felt good if you had talked to him. I can imagine that he would have been a fantastic father for his children. BDM: De Moor has been largely or even completely forgotten by the generation born after the mid-seventies. A pity, or something that was written in the stars? NS: Bob De Moor made some work that had international power, like Balthazar. But he was not really the ‘entrepreneur’; he wanted to be part of a bigger story. You can see this in his career path. In his first work for the Tintin-weekly he just filled the holes that they wanted him to fill. If they wanted some work for their Flemish audience, he made it, and when they wanted something else he made fantastic work, but exactly fitting their question. That was also his approach, working for Hergé. I was really surprised to read that he had put his mind upon finishing the last Tintin. That was, in my vision, not the kind of working-relation he had established with Hergé. And you can also see that in the way that he made the second part of Sato after the death of Edgar Pierre Jacobs. Het was too serving in a way. 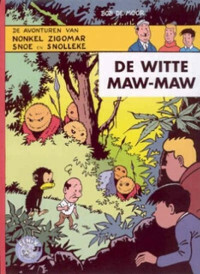 BDM: I noticed you also talked about the more obscure (often never re-published) work in the catalogue which he created in his early years, his pre-Tintin work for KZV, Kapoentje for instance. Naïve work or do you already see in there the talent he was to be? NS: His early work is a mix between the swinging drawings that were used in the States in that era, heavily influenced by the animation industry and Disney. And in other work you already see how good he is in using a clear line. 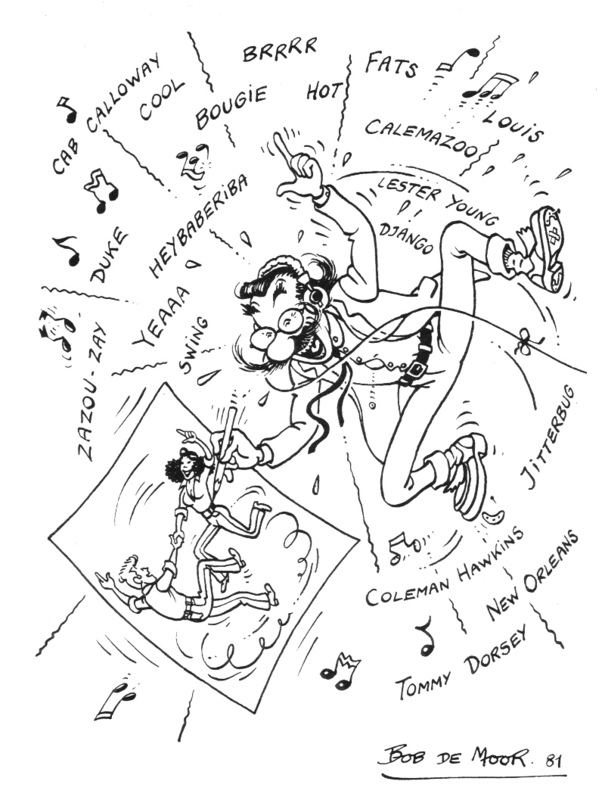 Typical for Bob De Moor was that he even changed his line for Barelli because Hergé asked him to do so, to make it more different from Tintin. In the lines he uses, you see his fabulous craftsmanship. BDM: What’s in your Bob De Moor collection? NS: I have sold a lot of my books and drawings, because the amount was just too much to keep finding room for. I also am more of a reader than a collector. Except from Marc Sleen, I sold all my antiquarian books. 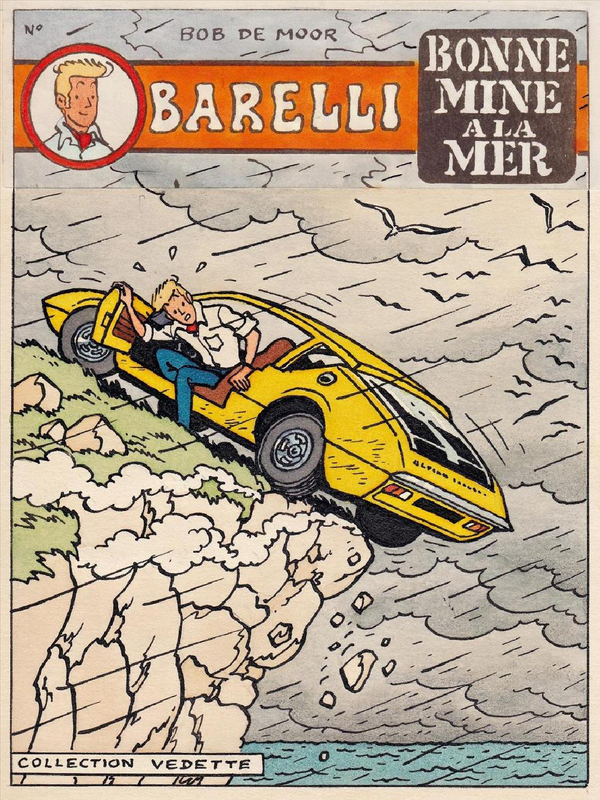 But I have kept a beautiful study in colour for a cover of Barelli from Bob de Moor, in a small format. BDM: You were active in politics, sometimes I get the impression that politics are even more surreal than the most weird comic scenario? NS: No, politics are a lot more boring then comics. So I’m glad I’m ready with politics, but I will never be ready with comics. In 1981 the city of Clichy (a commune in the northwestern suburbs of Paris, France) organised it’s 8th comic festival (from 12 til 14 June included). For the occasion Bob De Moor was a central guest together with Jean-Claude Fournier. 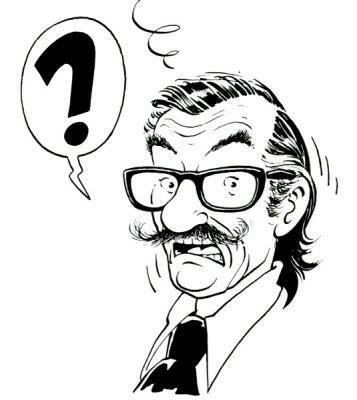 Jean-Claude Fournier, known simply as Fournier, is a French cartoonist best known as the comic book artist who handled Spirou et Fantasio in the years 1969-1979. Especially for the occasion De Moor made a special drawing featuring Barelli, Anne Nannah and himself. The drawing is one of those typically circle-sized De Moor drew over the years. In the drawing you can see Barelli and Anne Nannah dancing just like De Moor who is swinging on the music of whilst drawing the scene with the aforementioned characters. The music featured is clearly De Moor’s own jazz & blues music taste. And he has been dancing a lot looking at the state his shoes are in (plasters, parts falling off, nails coming out). We found this drawing in the now defunct comic magazine Archéopteryx n°2 which featured a special for the festival which was hidden in the archives of the family De Moor. 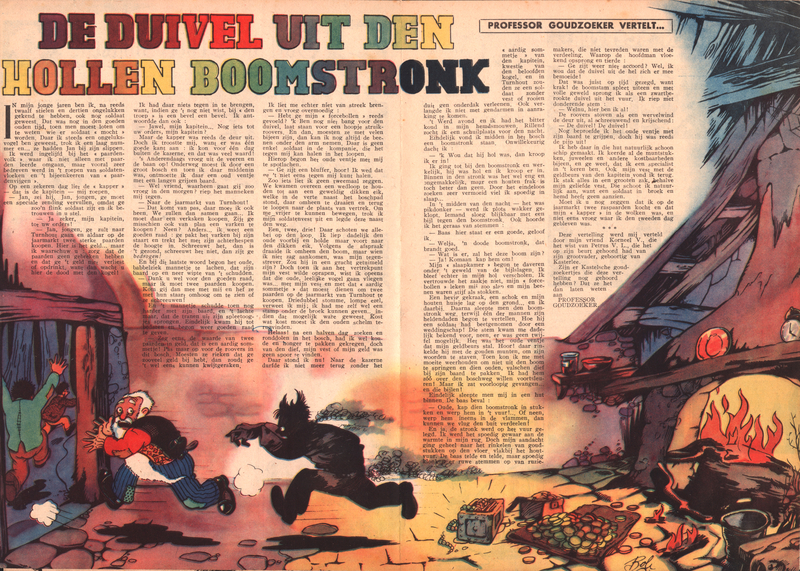 In the easter 1946 edition of KZV aka Kleine Zondagsvriend, Bob De Moor illustrated a story called “De duivel uit den hollen boomstronk” (The devil from the hollow tree stump) in the ‘Professor Goudzoeker vertelt’ series. The illustration – a splendid one – was one of many Bob De Moor would make for KZV for all kind of standalone stories for which he only took care of the illustrations and not of the text itself. We have been diving into our own archives to showcase you some of these illustrations. Today is the first one. It’s also the first time since 1946 that the illustration which we show you today sees the light of day again, and the very first time it’s being published on the internet too. The story itself is written in Dutch (albeit in a post-WW2 version with a slightly different spelling and a somewhat obsolete way of writing). The plot is the following: a soldier is asked to buy 2 horses in Turnhout (that’s near Antwerp). During his journey to Turnhout he gets robbed by an old man. After desperately trying to find the robber for hours and hours, he falls asleep inside a hollow tree stump, which gets axed by a band of bandits including the old robber. When the bandits fall out with each other, one of them calls for the devil. The soldier jumps out of the tree stump which is already set on fire after which he collects the money plus lots more which the bandits had stashed away. The illustration Bob De Moor made (and signed as ‘Bob’) shows this last scene. You can clearly see that the way of drawing instantly reminds of the style used by Walt Disney (which you can also find back in the album “Le Mystère du vieux chateau fort” released in 1947 via Campéador). Several elements also can be traced back to Bob De Moor: the shoes, the way the floor is drawn, both elements which we find back in the series Hobbel & Sobbel and Bart De Scheepsjongen which De Moor was drawing during that same period. The vivid colouring is pretty astonishing and was one of the key ingredients of KZV back in those days. 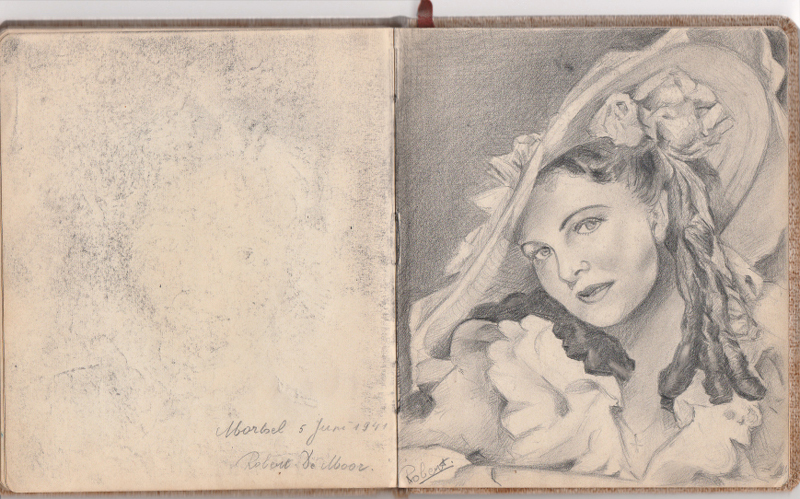 The original drawing probably went lost as is the case with many of the drawings De Moor made during that time. 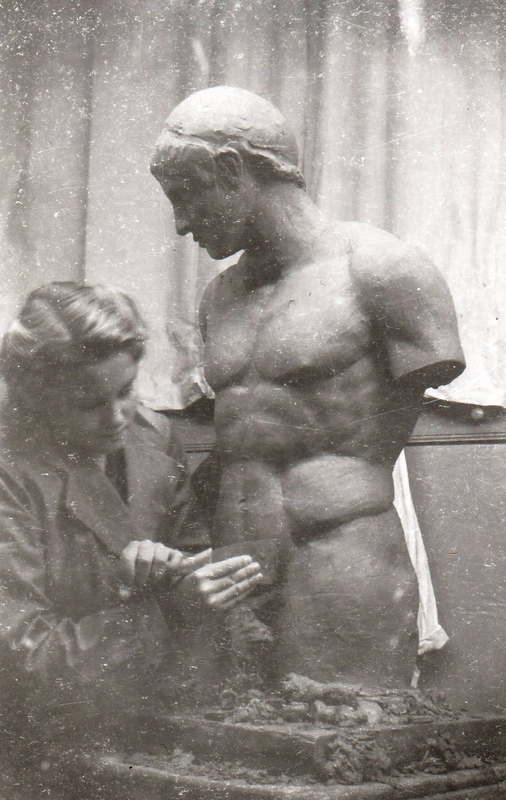 In 1948 en 1949 a new Bob De Moor (under the Artec Studios flag) series saw a publication: ‘Janneke en Stanneke’. It was the weekly comic strip publication ‘t Kapoentje which published the different stories. ‘Stories’ because many people think that there is only one Janneke en Stanneke story, namely the one which in the end got re-published for the very first time in album format by Ciso Stripgids (via Brabantia Nostra) in 1989. It’s not all that weird that many people are unaware of the other stories, because if you don’t get published, you easily get forgotten, and that is exactly what happened here. The stories got published in a weekly only and got forgotten over time by most people. 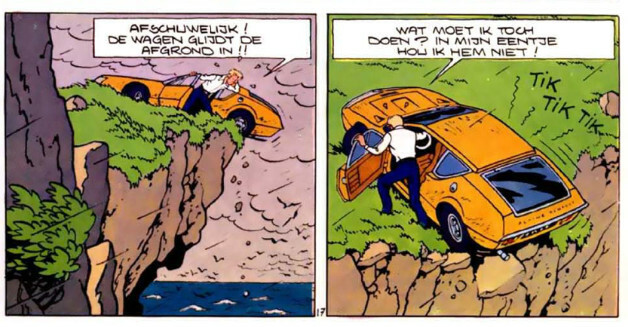 However, if you paid attention when reading the 1989 publication, you could have seen that the 60-strips long story actually is the follow-up story to another Janneke and Stanneke story. It starts with a text reminding readers what happened just before. Today we present you the strips 37, 38, 39 and 40 of an unpublished untitled story (in album format that is). Note that none of the Janneke en Stanneke stories actually had a title, which doesn’t really make it easier to know what you are looking at. The duo finds themselves in the company of indians this time. Don’t look too much for a story, because the series is actually a collection of gas with a loose story woven into it, the same with the story published in album format. Nevertheless, it’s part of De Moor’s heritage and a very good way to see how Bob De Moor‘s technique improved over time. In the page published today you can see that De Moor is still a bit clumsy as far as the structure of the page, strips and cases is concerned. There clearly was no plan when creating the story or the page in particular. Not surprising, that year he would complete at least 17 stories… so there was no time for much story development let alone a lot of preparation. Things had to move on, and fast because the contracts for new stories kept on pouring in at the Artec Studios. You can also see that De Moor struggles when it comes to putting people in a position which is not just walking or standing still. Look at case 1 and 2 for instance where he clearly is not at ease with the way he has drawn things. Also the use of a black shadow in the first 2 cases is not well-done (he would excel in it later on in his career through). Nevertheless, these are stories which definitely deserve a re-publication. We wouldn’t be surprised that the fine people at Brabantstrip will ‘attack’ this in the next months or years (hint hint hint!). 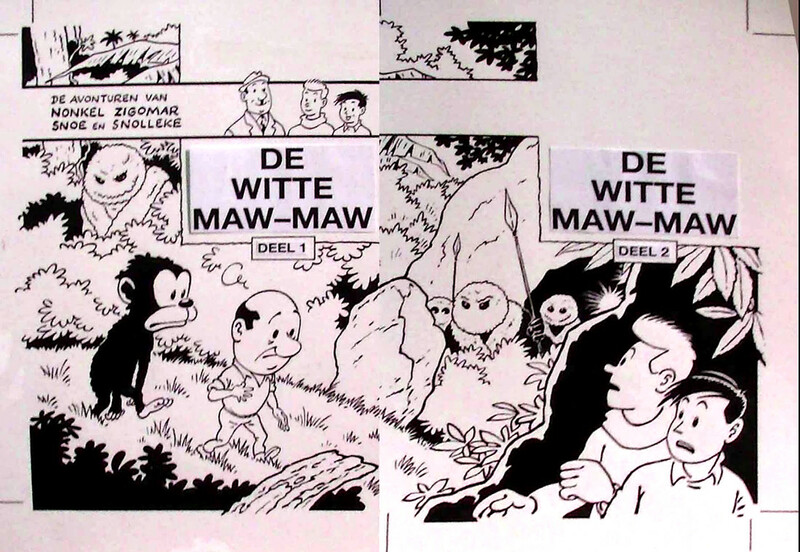 In March 1999 a black and white version of the Snoe and Snolleke album “De Witte Maw-Maw” saw the light of day. It was a collaboration between 3 comic strip festivals and the Brussels based Enigma publishing house and it seems they had really big plans keeping the Bob De Moor fans busy for quite some time collecting all the different parts, because yes, they had split up the album in 2 parts. The second part was to be released on the Comic Festival of Ganshoren later that year, on may 15th, to be followed by 3 parts compiling “De Spaa-motor”. Below the copy we have (thanks to Alain Demaret for giving this!). ‘Was’ because alas, nothing materialised except for this first part. Why? We’re not sure, but we have contacted some people to get some more info on this. Nevertheless, we know this, Johan De moor had drawn a cover for the first part and – and this many people don’t know – he also completed the 2nd cover artwork, which in fact together with part 1 composed one single drawing. We have known this for a while, but it was only when we stumbled on this blog post by the Brussels based comic store Het B-Gevaar that we discovered the 2nd part too. As you will see the cover artwork for the Fenix album version published in 2005 by Brabantstrip is quite different too from this 1999 version by Johan De Moor. Especially Snoe and Snolleke have been redrawn for the later version and added into the first cover, which creates a better balance. At the same time Johan De Moor gave them a more Bob De Moor style. We’ll update this story when we get extra information. 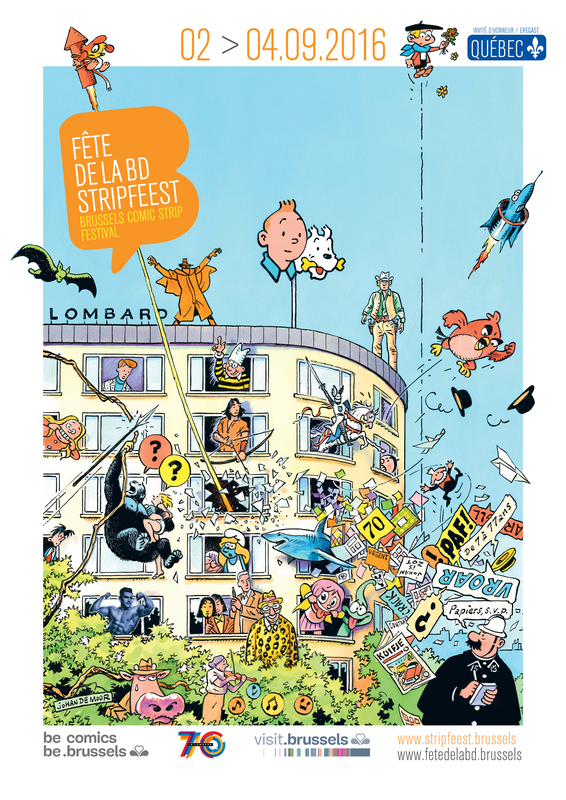 From September 2 through September 4 you can visit the Brussels Comic Strip Festival in the Brussels park. The festival has been celebrating comics of all kinds in Brussels since 2010, and welcomes more than 100,000 visitors each year. Young or old, amateur or specialist, there is always something for everyone among the many activities on offer. For the 2016 edition, the Brussels park will be hosting comic museums, dozens of publishing houses, exhibitions, book shops, comic sellers, conferences, workshops and hundreds of authors signings. The Brussels Comic Strip Festival also includes a night-time show at Brussels Park, the Balloon’s Day Parade, the Comic Strip Festival’s Rally, comic strip exhibitions and activities throughout the city. We have been there for the past few years and it’s always a delight meeting authors, publishers and friends. 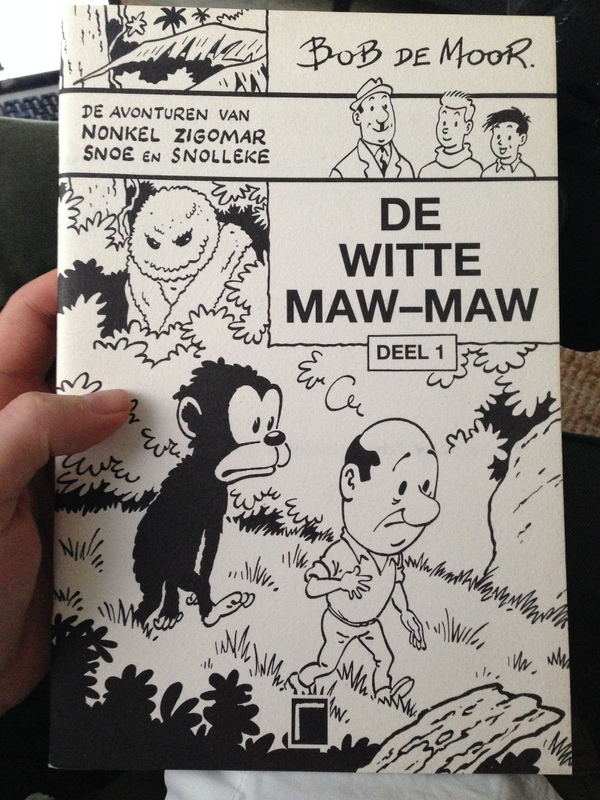 For Bob De Moor fans, there is a big chance you’ll be able to complete your collection there as there are always shops present which also cater to the more ‘conservative’ comic strip fans. But, let’s get back to the subject of this article. Johan De Moor has completed the official artwork for the Festival’s posters (thanks to Alain Demaret for the info). On the poster we not only find the characters such as Tintin, Smurfette, Ric Hochet, Thorgal, the Chevalier Ardent, etc., but also Balthazar. Yep, that funny abstract character which De Moor developed in 1975. We all know that especially Balthazar is one of Johan’s favourite characters, so that doesn’t come as a surprise. 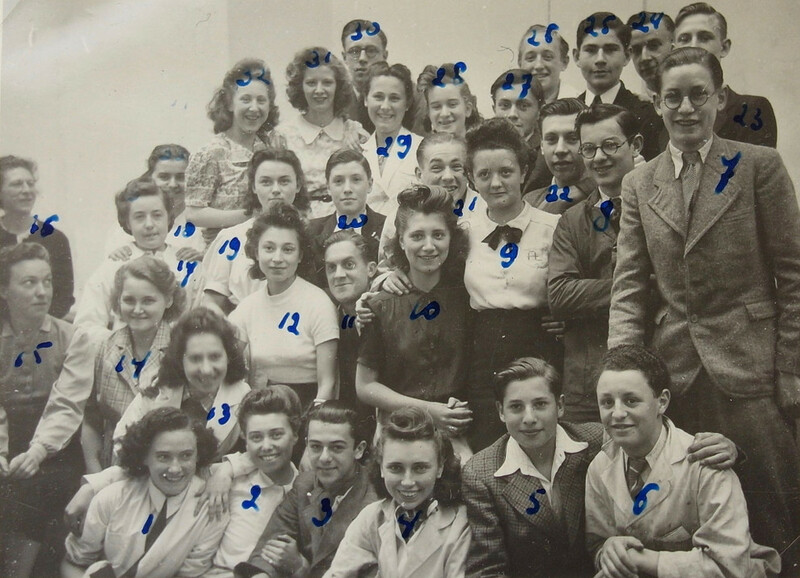 I’m sure you will recognise a lot other characters including a reference to Willy Vandersteen (“De schat van Beersel”). Quite a nice poster this one is!